Everything in this landscape– including the stone– is done in greens, whites and purples. The design at 48 North Parade St., Buffalo, was part of the Front Yard Competition, an event in the National Garden Festival in Buffalo in 2010. As we promised, throughout the winter we’re showing you designs from the competition to help you plan your own front garden. The homeowner did have one wish: to keep the already planted spiral Alberta spruces. Haentges relocated them to the back yard. The landscaper used Copthorne Unilock pavers for the walkway, which you can see in the photo at right. 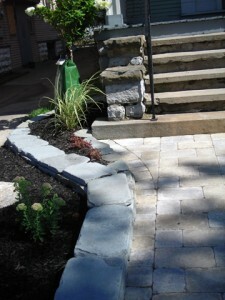 A side garden was built along the walkway leading to the front steps. It is held in place with walls built of tumbled blue stone. Notice that the designers added interest by building the garden on two levels. The main part of the garden is at one level, and the section closest to the stairs is stepped down at a lower level. 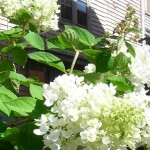 The tree to the left of the steps is a flowering hydrangea. A close-up view is at left. Balancing it on the right is a large-leafed catalpa, which you can see in the garden along the porch in the photo below right. 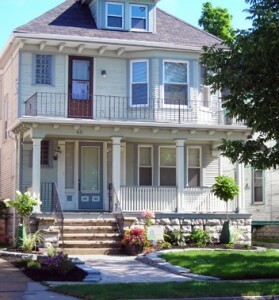 While the front garden runs along the front of the porch, notice that the garden doesn’t follow the straight, rigid lines of the porch. Instead, the garden flows with a graceful curve. Haentges chose to fill the garden with perennials to match the colors of the house. They include cone flowers, hydrangeas, ornamental grasses, daylilies and sedum. 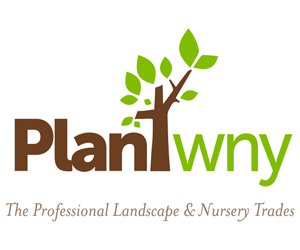 S & R Greenleaf Landscaping won Honorable Mention People’s Choice Award (Small Gardens) and Chairman’s Award for Sustainability. 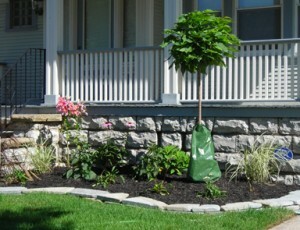 For more ideas, read about the front yard makeovers at 80 North Parade and at 28/36 North Parade. Do you like what you’re reading? You can receive our e-mailed magazine every week for free! 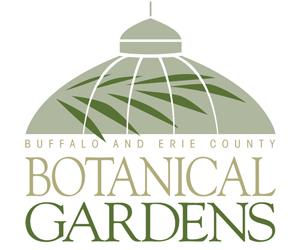 Just use the “Subscribe for free” box at the top center of this page, or e-mail me your zip code at Connie@BuffaloNiagaraGardening.com and I’ll sign you up.